Well, we got a little milk from Sissy one night, and it was our first time successfully getting milk in a clean bottle from either goat. So we brought it inside and let it get cold. Then we each got a little cup, and all six of us stood in the kitchen ready to drink. We figured, if one of us was going to die, the rest of us better do the same. It was really hard to get over the mental image! So we all hesitated, except for Esmond (the three year old). Esmond took a sip, promptly screamed, threw the cup back on the counter and took off running and crying. Naturally, the rest of us were terrified. We each tentatively took itty bitty little sips, and...I started crying and begging Jeremy for a grain-fed milk cow and a sterile milking system with a pasteurizer and a homogenizer. Just kidding, I didn't really cry. I don't cry. Eowyn claimed that she loved it. Gideon sided with me, and Jeremy said, "it's sweeter... but it also tastes like hay." Noemi didn't seem to have an opinion. So what are we doing? Just because we can't get over a mental hang up does not mean we can't get over it. (Does that make sense?) So what do we do? Well, we got over it. It just took some time. We still aren't getting enough milk for our house, because those babies are so selfish. (Joking.) But we do get some, about 8 cups a day. The first week, I mixed it with store bought, and that helped us get over the mental taste difference. Because there's not a huge taste difference, it's just in our heads. I've made some cheese, just a little fist full, twice now. And the cheese is amazing. I eat that whole fist full. But Jeremy and I still hesitate slightly before we take a sip. I think it's more about knowing, really knowing, exactly where that sip came from. It didn't come from the store in a plastic jug that has no resemblance to its actual origins. We are just so far removed from our food sources that when we get a little closer, it freaks us out. And right now we are up close and personal with our food source. Really up close. Really up-in-their-business close. But it's good. It's good to know where our milk comes from. It's good to rely on what God has given us. Just this morning, for breakfast, we had sausage from a local farmer, eggs from our chickens, biscuits made by hand and made with our milk, and fresh milk to drink. We are very grateful. And we are slowly getting used to the knowing. Vegetables and eggs are easy to know. Vegetables are fun and don't take such a leap from not knowing our food to knowing our food. Although, even with vegetables, you have to get used to the fact that not all vegetables are grocery-store-pretty. Eggs are fairly easy too. Even though they can look dirty at times, they have that wonderful shell that can be washed off before we crack them, if needed. But milk. Milk literally comes out of an animal. Eggs do too, but we don't pull it out. We collect the milk, we coax it out from our goats' orifices. And when you think about it that way, it's kind of hard to drink it. This is also most likely why people have problems with breastfeeding. All these problems go back to our culture's fear of uncleanliness. Everything must be sterile for our safety. Sterile things don't make fruit, though. Cleanliness is necessary, but sterility is not. When we create sterile plants, we only get one fruit bearing plant. Do we want to rely on one plant for the rest of our lives? Or do we want a plant that will give us more plants every year? When we create sterile environments, we leave lots of room for superbugs (or just normal sized bugs) to take over. After Esmond and I were cleaned out with the strongest antibiotics at his birth, we were horribly sick and completely dependent on antibiotics for the next 8 months. He had swimmer's ear when he was six months old in the middle of winter! That's crazy. God created seed-bearing trees. He created a self-propagating earth. He created bacteria for reasons, too. Reasons that we're just now starting to learn about. Sterility's popularity is a direct result from uncleanliness, we've just swung too far to the other side. There's gotta be a balance. Uncleanliness causes sickness and death, but sterility causes extinction, too. So we're finding our balance here, with clean, raw milk from healthy, clean animals. 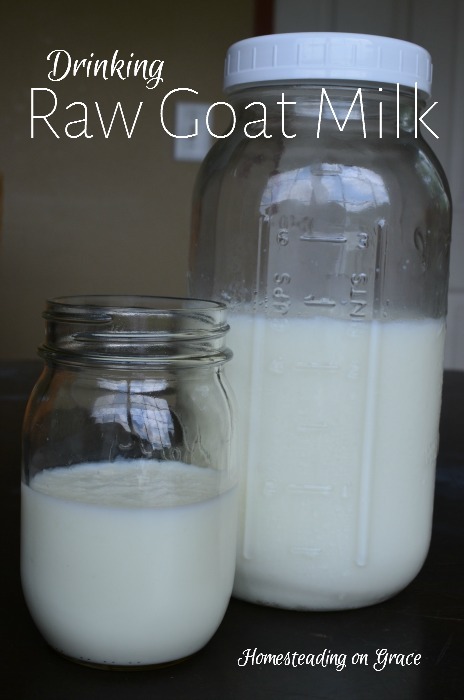 All that to say: Add chocolate to your raw goat milk. You won't hesitate anymore. Hello Jennifer! I just discovered your blog. May the lord Jesus the messiah bless you and your family. Hi there. I just started milking my two Nubians last week. First fresheners. New homesteaders. Never had goat milk. My son is too young to know the difference of what's in his sippy cup, but my husband and I both hesitate. I have my first batch of yogurt incubating right now, and I'm almost certain I'm going to hate it. Haha! That mental leap! Anyways, I just wanted to say that's it's really comforting to read your story and know that we're not crazy, and we're not alone. Thanks for sharing!